Bear Naked - Bear Camp Cabin Rentals. "Bear Naked Inn" is a beautiful, unique custom-built log cabin nestled in a wooded setting located in the Hidden Mountain Resort in Wears Valley. This 3 bedroom and 2 bathroom cabin is approximately 10 minutes from the parkway in Pigeon Forge, Dollywood & Splash Country and 20 minutes from Gatlinburg. The roads traveling to the cabin are paved with some curves and inclines, but nothing too steep. The driveway is also paved and will accommodate up to 4 vehicles comfortably. There are no steps to enter into this cabin. When you enter you will be pleasantly surprised by the wood interior and the comforts of home. This 3-bedroom, 2 bathroom cabin will sleep 8 people comfortably and is 2 levels. You can access the upper-level deck from the master bedroom, living room and kitchen. Access to the lower level deck, which is where the 52 jet Hot Tub is located, will be through the game room or the bedrooms. The main level has a very spacious living room to enjoy family time or catch up with old friends. Relax and unwind on the new sofa sleeper while watching your favorite TV show on the Flat screen TV, enjoy the DVD player which is WIFI compatible, or read a book on the new love seat. After hiking in the National Park kick your feet up in one of the 2 new recliners. On those winter nights, grab a cup of hot cocoa and curl up in the front of the double-sided gas fireplace and rest after a long fun-filled day. Enjoy sitting on the screened in porch just off the living room while taking in the wooded setting that surrounds you, or bring your favorite food to cook on the gas grill which is located on this deck as well. Adjacent to the living room is the large fully equipped kitchen with stainless steel appliances and an island stove. There is ample counter space to prepare any meal your heart desires and dining for 6. Also, located on this level is the master bedroom with its own private bathroom. In this bedroom, you will have a new King size bed, Flat screen TV, and a double-sided gas fireplace for those cold winter nights. The bathroom has a double vanity, large Jacuzzi tub to relax and unwind in and a walk-in shower. On the lower level, there is a split stairway that leads to the game room on the left which has an interchangeable air hockey table with table tennis for those who like a friendly game with family and friends and for the pool shark there is also a pool table. On the right, you will have 2 additional bedrooms and the washer and dryer. Both bedrooms will have a comfortable Queen size bed and they share a bathroom with a shower/tub combination. There is also an additional vanity sink just outside the bathroom. If a peaceful and relaxing vacation is what you are needing, then what are you waiting for? 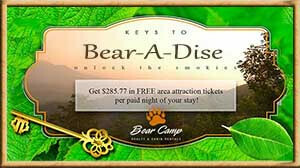 Book "Bear Naked Inn" today! Don't miss out----Book this beautiful, unique custom-built cabin today!!!!!! Service was AWESOME!! Everyone was super friendly,and the courtesy calls to check on us made our stay even better. The cabin was clean and comfy. We have booked with Bear Camp 3 times, and will definitely be back!